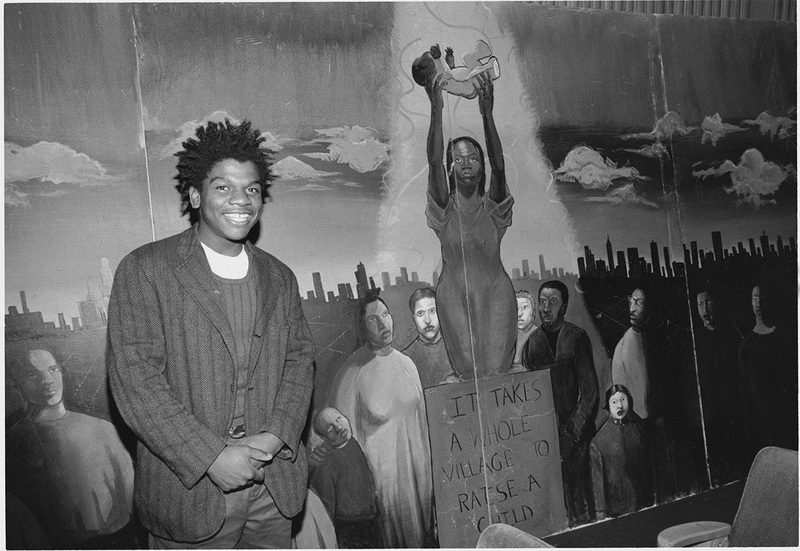 Artist Kehinde Wiley standing in front of artwork created during Young Artists program. Artist Kehinde Wiley, a Metro Art Young Artists program alum was recently commissioned by The Smithsonian’s National Portrait Gallery to create the official portrait of former President Barack Obama. Click here to read the official announcement by The Smithsonian National Portrait Gallery. The announcement has garnered significant press coverage from The New York Times, CNN and Los Angeles Times. Following the end of each presidency, the museum partners with the White House to commission two sets of official portraits of the President and First Lady that are hung in the White House and the National Portrait Gallery’s world-renowned exhibition America’s Presidents. Artwork created by Kehinde Wiley during Young Artists program. At age 17, Wiley was one of fourteen young artists selected to participate in Metro’s Young Artists program initiated in the 1990s. During his time in the program, Wiley created a large-scale mural that was reproduced and placed in 2,000 buses. The portraits of former President Barack Obama and former First Lady Michelle Obama are scheduled to be unveiled at the Smithsonian in early 2018. Click here for more information about America’s Presidents.